If you are a Christian who studies Bible prophecy then you are one of many who are hoping and praying that this “announcement” will be their decision to finally build the third temple. Prophetically speaking the bible tells also tells us that in the future a third temple will be resurrected. This is found in Matthew 24:15 that states, “Therefore when you see the ‘abomination of desolation,’ [Anti-Christ] spoken of by Daniel the prophet, standing in the holy place [Jewish Temple]…” The word, “holy place,” used in this Scripture, is referencing the New Jewish Temple that will be rebuilt in Jerusalem in the near future. Today the Temple Institution has devoted themselves specifically to that cause. They have restored over 60 different sacred temple vessels including: the Priest’s breastplate, the crown of the priest, the shofar, musical instruments, the laver, the mizrak, and more. Some of the most important vessels have also been completed: the Menorah, the Incense Alter, the Golden Table of Showbread, and the infamous Ark of the Covenant. The Temple would have been built by now if it wasn’t for the Muslims, “Dome of the Rock,” standing in the place the Israelites desire to build. In truth, the temple can’t be built until some kind of arrangement can be made to either, build it where the “Dome of the Rock” lies or build it in another location. 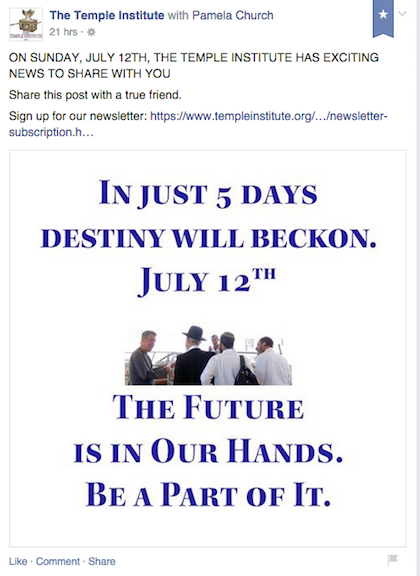 Could it be that this “exciting announcement” has something to do with a third temple? Coincidentally, as the announcement arose from the Institute, the Rabbinical Sanhedrin, who are linked to the organization, made a treating declaration to the pope in regards to his comments on Palestine. Could it be that their announcement has something to do with the fact that they are infuriated with the pope? Will the Temple be built Next to the Dome of the Rock?? UPDATE!! HERE is the Announcement! The rebuilding of His Temple: is it in the hearts of men, women and children or will it be a physical building? What are the prophecies over Jerushalayim until the end of time upon earth? Yahshua was the Temple resurrected in just three days. Obviously, He did not mean a temple hewn from rock? How should we interpret prophecy? The “temple” is your body in which your “heart” and “consciousness” exist. The abomination that makes it desolate will be the setting up of a false god in this “temple” using “High Technology”. God does not dwell in houses made with hands. The inhabitants of Jerusalem have been stoning and killing the prophets sent to her for a long time, and nothings changed. For those who have true “faith”, Jesus was resurrected from the dead by the power of his Father. No manmade high tech involved. Like I said, superior artificial intelligence will be “setup” to act as a “god” in the “temple”, i.e. your body and mind. Satan ain’t playin’ games! Lisa , Let me start out by saying I am a witness for Jesus Christ of Nazereth. Just like our Lord is a personal savior the devil is a personal devil and will send workers right to you to take your soul. I had such a devil come for me only he came in the form of a man who owns a gunshop in Sarasota florida .This champion for satin casts the spirit of death and suicide on his wepons. 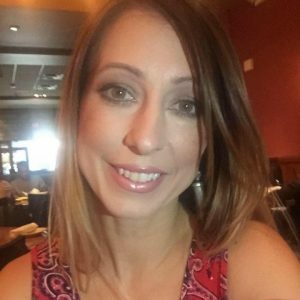 Its a long story if your interested you can call me my phone#is on my website. . I have proof to back up what I’m talking about. I pray as a Christian with an audience that you choose to warn other Christians. My testomney is at the eternal planner on youtube i pray you take the time to listen so you know I’m for real. Time is short and with Jade helm 15 just about to start I fear christians will run and buy guns not trusting in the word of God. 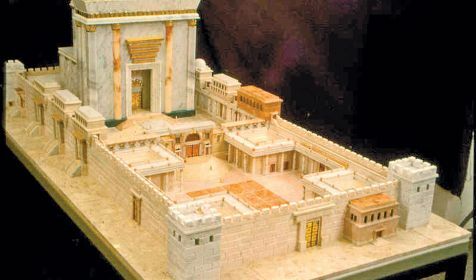 The Third Temple – When will it be built? Made some comments, but they’re no longer visible. Guess someone or some “thing” doesn’t like them. Too bad! Truth is not popular. On May 14, 1948, in Tel Aviv, Jewish Agency Chairman David Ben-Gurion proclaimed the “State of Israel”, establishing the first “Jewish State” in 2,000 years. This is a fact that cannot be denied! Modern Israel is a “Jewish State” setup by the Jewish leadership of the “Sanhedrin”. May, 1948 plus 70 years equals May, 2018! The end of the desolation of Jerusalem will come, according to the prophet Daniel, in May of 2018!